(l to r.) Reporter Gary Webb (Jeremy Renner) visits the jailed Ricky Ross (Michael Kenneth Williams) in the company of the latter’s attorney Alan Fenster (Tim Blake Nelson) in KILL THE MESSENGER. ©Focus Features. HOLLYWOOD—You’d be hard-pressed to find another actor involved in as many Hollywood blockbuster franchises as two-time Oscar nominee Jeremy Renner (“The Hurt Locker,” “The Town”). The native Californian not only has a recurring role as archer superhero Hawkeye in Marvel’s “Avengers” franchise, he also took over from Matt Damon the “Bourne” franchise with “The Bourne Legacy” playing a different rogue agent. As IMF Agent William Brandt, he’s instilled in the “Mission: Impossible” franchise as well. And yet the chameleon-like action star has time to do one-offs like the upcoming based-on-a-true story drama “Kill the Messenger,” in which he plays a journalist who ends up being the story. The 43-year-old actor, who grew up in blue-collar Modesto, Calif., says he was intrigued by the real life story of a reporter who tried to expose what he viewed as a flagrant abuse of government power, but instead became the target of scrutiny and paid the ultimate price for his investigative work. 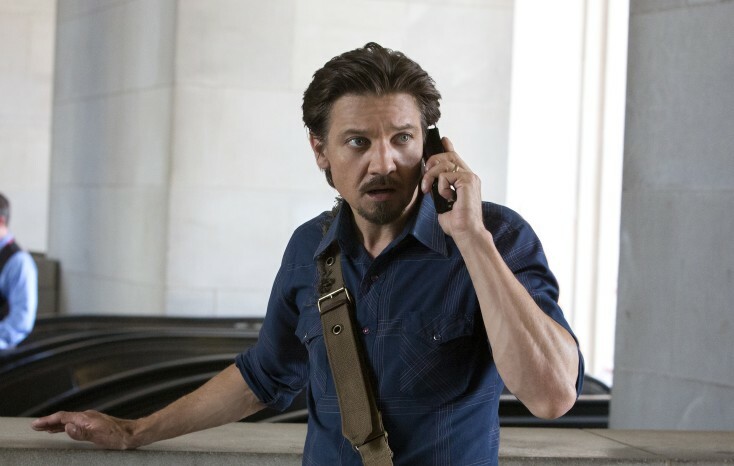 “Kill the Messenger” opens next month and could garner Renner additional awards consideration for his depiction of the tenacious maverick journalist. As an actor, Renner could relate to getting a lot of doors shut in his face before he achieved some success in his chosen field. Now a father to 19-month-old Ava, with model Sonni Pacheco, the actor is on top of the world. Fatherhood, however, is not slowing him down career-wise. It’s merely given the talented actor a different perspective on life. He recently spoke about making “Kill The Messenger,” in which he also serves as a producer through his The Combine production company, and what’s ahead. Q: What was your attraction to this role? Renner: There were a lot of things. At first, it was selfish things, like, “Wow, this is an amazing role. It’s an amazing story.” And then I got to the end of the script and was like, “Oh, wait, this happened around the corner from where I grew up. I knew nothing about this.” The fact that it is was a true story was the main reason why I was like, “Okay. This needs to get up on the screen.” Otherwise, it could just be good TV. But because it was a true story, I just thought, “This just needs to be broadcast. It needs to be louder. Make more noise.” That was the ultimate reason, for me, to make this movie. I knew it was going to be hard because people don’t make these kinds of movies anymore. They made them in the ‘70s. You just need to find some headwind and get the money to get it made. Q: Did you use this as an excuse to sit down with screenwriter Peter Landesman and talk a little bit about the research that he did? Renner: Yeah. That was sort of my version of speaking to Gary Webb. It was like, “I’m so foreign to the idea of what investigative reporting is. Tell me what’s that about? What do you ask, and why do you ask? Do you lead people? Is it psychological things involved in it? What are you trying to get at, power-wise?” I just had to pry and prod him for information bur he was very helpful. And Gary’s ex-wife Sue Webb and her family gave me lots of videos to watch of Gary. That tied me to Gary, personally, so it helped tremendously. Q: How did you approach playing a real character versus the fictional ones you usually play? Renner I had a great road map of a place the way it exists, which is an amazing thing. Then you have great limitations from that road map. It’s hard to deviate from, creatively, as an actor. It’s like, “He’d never do that.” He’s not a well-known guy, though, which helped. It’s not like, “Oh, I have to mimic him.” I wasn’t playing JFK, with a specific accent or something. So I had a little bit of freedom with Gary. Q:. Have you ever experienced frustration at the level that Gary had, and have you ever had to fight for something as hard as Gary did? Renner: I don’t think there’s been anything as important to me as what he was working on. If I ever got frustrated, I get the feeling it might feel as intense. I guess it would be that I’ve been told no my entire life. I come from a town where you get married and have babies, and you’re probably working on your third divorce at my age. Nothing wrong with that, I guess. Both my parents did it. I don’t know, adversity. It depends on how you look at it. To me, I look at it as fuel. I could never do what Gary did; I’m too self-serving. I think as an investigative reporter, even if it’s a version of serving one’s self’s ego, what you’re doing with the output is so selfless. He put his wellbeing at risk to tell a story, to find truth. There’s a version of that in my job. All I do is try and find truth in every moment, every relationship, as an actor, as a character. It’s all about truths. Q: Are you a bit of an outsider, as he was? Renner: I suppose. There’s always some part of me that’s in a character, and there’s some grey lines between Gary and I, some belief systems and how we view things, for sure. He’s a bit of an outsider. I would consider myself that as well. I’m not complacent. Q: There seem to be shades of “A Beautiful Mind” in this. Can you talk a little bit about the paranoid qualities of the character you’re playing, and how you brought that forward? Renner: I wasn’t playing paranoid. For my character, it was happening. Everything is very real. What I see is what I see. So, to me, it was no different than any other part of it. Q: Did you learn something about journalists after playing this guy? Renner: Yeah. I thought it was interesting, outside of what the job is and what it entails, not even on the depths of what Webb had done, and the things he’s written. He’s written some really great articles. I looked at sort of the psychology behind it, what the job is, and it’s really interesting. What I found most interesting was the relationships. It can be a rather lonely, isolated job, and then the relationships with the editor is really interesting, and the bureaucracy and the corporate life of a newspaper. Q: Have you come to a point in your career where you’ve thought, “Well, this is it,” or do you still feel that adversity and struggle? Renner: I hope this isn’t it. (He laughs.) Maybe it’s a plateau, and then there’s still a lot more to climb. There’s still a lot more to learn, and a lot more to grow, as a man, as an artist. In my mind, when that stops, I’m happy to be gone. You can just put me six feet under. I don’t want to sit and not grow and learn anymore. Maybe it’s a great plateau, and I can take a nice deep breath. The view is amazing from here. Q: Can you talk about some of the upcoming films you’re working on? Renner: Yeah, there are a handful of them. This is a great one for our company, because it’s the first one we’ve produced, and it’s sort of what we want to do. One is “King Of Heists,” about the biggest bank robbery in American history. It’s very, very exciting. It’s kind of like (Michael Mann’s 1995 bank heist drama) “Heat” but set in the early 1900s. It’s really cool. And then there’s a (director) Steve McQueen project that’s really fascinating to me. And there’s “Slingshot,” a great rally racing movie, another theme of underdogs. And then “Mission: Impossible,” I’m going to go shoot in a week. “Bourne 5” will happen next summer. And then there’s grumblings of “Captain America 3.” I don’t know what’s going to happen there. I’ve got to find the time, man, to stay home, and I can’t.